Cynics might look at Mike Kern’s plan to open the Washboard Eco Laundry in west Hood River and call it “greenwashing.” But in the truest sense of the word, that’s exactly how Kern wants people to think of the business. “It’ll be the most energy-efficient laundry in the Gorge, and maybe even in Oregon,” Kern says. His plans call for 21 Electrolux High-Spin “H” models that will extract almost every drop of water by creating 350 G’s (the force of gravity) on the spinning drum wall. 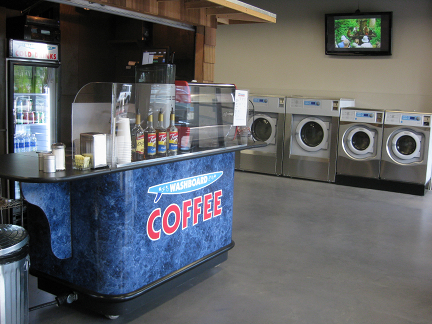 He compares his equipment, for example, with those in the Hyland Eco Laundry in Beaverton. They generate 200 G’s. The average home washer generates 100 G’s. So we’ve got a little bit of an arms race going on here, but in the positive direction. Factor in high-efficiency gas-heated dryers that employ reverse spin to fluff fabrics, and you’re looking at a 30 percent drop in drying times. A load that would take 33 minute previously now will be ready to fold in 23 minutes. 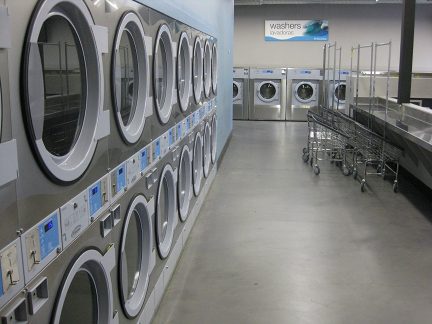 “When you combine the washers and dryers, it’s state-of-the-art as far as energy efficiency is concerned,” he says. Add in “99.8 percent efficient on-demand water heaters,” and you’ve got some genuine energy savings. Wash drum sizes range from 60 pounds down to 18 pounds. For those folks who would rather not do laundry, the business will also offer drop-off “wash-n-fold” service, and commercial service for businesses that have large linen loads — caterers, restaurants, hair salons, motels and vacation rental managers — but no desire to do it themselves. “Doing laundry isn’t very exciting,” Kern says. So, for people who might otherwise think of themselves as trapped while the jeans and t-shirts go round and round, Kern plans to outfit his wash-a-torium with big-screen TVs, an espresso cart, and a children’s play area. Kern, who has been managing the Snap Fitness franchise since it opened in January, is building out his laundry space two doors to the west in the Hood River Square. A Montanan with a business degree from Montana State, Kern had learned to love Hood River while spending his summer here, teaching windsurfing. After 18 years with Enterprise Car Rental, he figured it was time to get back to paradise. But how to make a living? Big question, familiar to many in the Hood. He started planning the eco laundry in the summer of 2009, before the gym opportunity came up. 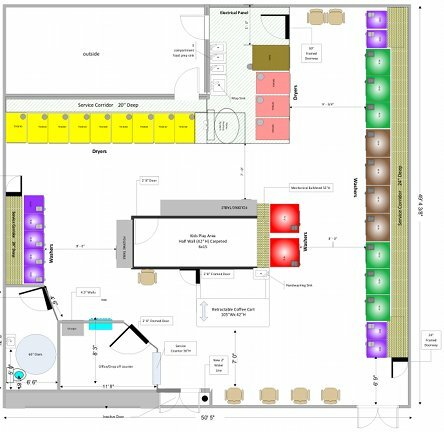 In talking with shopping center owner Mike Kehoe about the laundry’s space needs, Kern learned of the fitness center gig, and figured the proximity of the two spaces would let him tackle both. Kern hopes to have the Washboard open in early September. To introduce the public to his version of greenwashing, he plans to offer two days of free use. Address: 2940 W. Cascade Ave., Suite 103.